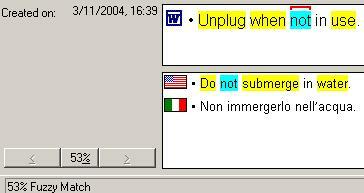 That's right: "Do not submerge in water" is supposed to be a 53% match for "Unplug when not in use". Trados' matching algorithms have long been known to be among the poorest of all translation memory tools, but this takes the cake! Yep, definitely proof that they're in the wrong business... I just wonder what business would be right for them? Pool cleaning? At least the "water" segment would make more sense. Well, two out of five words match. Depending on your settings, you may have instructed the program to consider this as "fuzzy." As you said, you keep the "Minimum match value" low so that you get useful suggestions especially for long sentences. Perhaps that strategy backfires in short sentences. Personally, I keep the "Minimum match value" at 68% to avoid nonsensical results like the one you show. But I may not catch useful partial matches in longer segments. But all that aside, would it really be so difficult to program an algorithm that takes the segment length into account? The thing is, you have to consider two things, speed against fuzzynes, and what looks consistent to the user. 2. People moaning that there is no logic behind fuzzy matching. They would think of the results they get as not being consistent. If 3 out of 10 words match and you get no match, but in the next segment 9 out of 30 match and you suddenly get a match. It would confuse customers. I'm not sure if I understand you - as regards speed, maybe, although I don't think Trados, with all its defects, is particularly slow (at least on a decent computer) - and good programmers would be able to speed it up while improving the matching algorythms. As regards the fuzzyiness, though, I'm really complaining of the fact that the index of fuzzyines displayed by Trados does not correspond to the similarity between the previous and current segments: "53% fuzzy match", if anything should mean that there is at least a certain similarity between two segments. 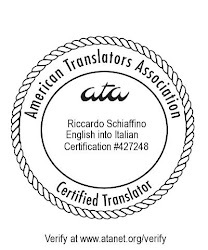 Is there anyone in the Boulder-Denver area who could give me a couple of hours of Trados training? If you want a couple of hours of training on Trados, I could help (I'm in the Denver-Boulder area myself). To contact me, please go to our company's website (www.aliquantum.biz) - you can find my e-mail address there, in the "profiles" and "contact us" sections. Sorry: I prefer not to post it in the blog, because I receive too much spam already. I want to say something in plus to trados matching engine. I found a great match between those 2 phrases.